Frontline Books is based in the UK. This new book has a copyright of 2017. It is soft cover of 174 pages in 7 1/2" x 9 3/4" page format. looking down at an Italian flying boat at rest in a harbor. A photo of a Beaufighter showing its rear that is diving over water. A photo of a rocket attack on a pier. The back cover shows a attack on a Axis cargo ship that has a splinter camouflage. There are several gun hits creating splashes behind it and some hitting its stern. Britain's position in the Mediterranean was a precarious one for much of the early months of WW II. This vast area, so far from the the UK and dominated by the Axis-held countries of Italy and Libya, posed unprecedented problems for the Royal Navy and the RAF. The German invasion of Greece, the eastwards drive of Rommel's Afrika Korps and the Siege of Malta saw British forces pushed to their very limits. 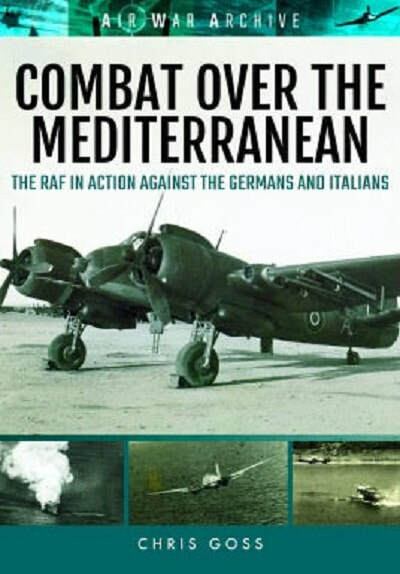 In Combat over the Mediterranean, Chris Goss has been fortunate in acquiring an unrivalled collection of photographs of allied Aircraft in action across the Eastern Mediterranean. These images show the men and machines in operations that included convoy escorts, raids on Axis ground transport, and strikes against enemy shipping. As the war progressed, and the Allies began to gain the upper hand in the Mediterranean, attacks were delivered by the RAF on Axis ground forces, even mounting rocket strikes against German positions just days before the end of the war in Europe. Through a remarkable collection of unique images, this book tells the story of the War in the Mediterranean as never seen before. Having retired from the RAF with the rank of Wing Commander, Chris Goss is a regular and highly respected contributor to major aviation publications in the UK, France and Germany, as well as the author of 24 critically acclaimed books covering the air war between 1939 and 1945. Chris completed an MA with Merit in War Studies in 2001. There is a total of 221 black and white photos in the book, including the ones on the covers. Nineteen of the photos are of the Beaufighter. One is of a Me-110. The majority of the photos are of attacks on ships and shore installations. This is a nice photo album, but a little too heavy on aerial shots of straffing attacks on Axis shipping and landing areas. I wish to thank the folks at Casemate Publishing,who sent me this review sample,and also Frontline Books.